Nineveh's partially reconstructed Adad Gate. Nineveh (Akkadian: Ninua; Aramaic: ܢܝܢܘܐ; Hebrew: נינוה, Nīnewē; Arabic: نينوى, Naīnuwa), was the capital of the ancient Neo-Assyrian Empire. It lay on the eastern bank of the Tigris River, across the river from the modern-day major city of Mosul, Iraq. First mentioned in ancient texts around 1800 B.C.E., Nineveh became an important trade and religious center and was Assyria's capital city from the ninth through the seventh centuries B.C.E. It was destroyed when the Assyrian Empire collapsed c. 612 B.C.E. In the Bible, it was the site of Jonah's famous preaching after escaping the belly of a great fish. Archaeological discoveries from Nineveh include several palaces and temples, and impressive fortifications. Its "Palace without Rival," constructed by Sennacherib, included 80 rooms and was 1680 feet long by 810 feet wide. It featured colossal statues, massive bas-reliefs depicting its own construction and scenes of Assyrian history, and the contemporary world's largest known library, whose clay-tablet texts are a rich source of information about the culture of ancient Mesopotamia. Nineveh is also the name of the modern Iraqi province in which the ancient city is located. Home to a majority Sunni Arab population and an ethnically diverse minority of Kurds and Assyrian Christians, it is the site of the oil processing center of Mosul and plays a large role in Iraqi politics. 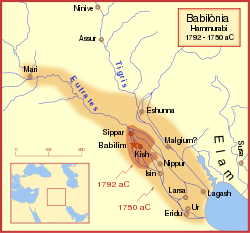 Nineveh's location is shown at the far north, in the Babylonian Empire of Hammarabi. It later became the capital of the Neo-Assyrian Empire. Ancient Nineveh's mound-ruins (36°22'N 43°09'E), known as Kouyunjik and Nabī Yūnus are located on a level part of the plain near the junction of the Tigris and the Khosr Rivers within an 1800-acre area circumscribed by a 12 km long (7.5 mile) brick rampart. This whole extensive space is now one immense area of ruins overlaid in parts by new suburbs of the city of Mosul, Iraq. Nineveh was an important junction for commercial routes crossing the Tigris. Occupying a central position on the great highway between the Mediterranean Sea and the Indian Ocean, thus uniting the East and the West, wealth flowed into it from many sources, so that it became one of the greatest of all the region's ancient cities. Nineveh's founding is a matter of conjecture. Texts from the Hellenistic period and later offered an eponymous Ninus as the founder of Nineveh, using a common convention to explain the origins of ancient cities. Some versions of Genesis 10:11 attribute the founding of Nineveh to an Asshur: "Out of that land went forth Asshur, and builded Nineveh." 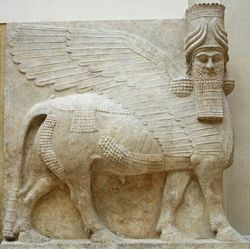 Asshur, however, was the name of the chief Assyrian god, equivalent to the Babylonian Marduk, and it is from this deity that Assyria's name was taken. Other versions give Nimrod as the founder. The historic Nineveh is first mentioned about 1800 B.C.E. as a center of worship of the goddess Ishtar, whose cult was responsible for the city's early importance. The goddess' statue was sent to Pharaoh Amenhotep III in the fourteenth century B.C.E. when Nineveh was a vassal of the Hurrian kingdom of Mitanni during its struggles against Egypt. The Assyrian kings of Assur soon captured the city. Evidence does not show that the early Assyrian monarchs built extensively in Nineveh during the second millennium B.C.E. Later monarchs whose inscriptions have appeared on the high city include Shalmaneser I (c. 1265-1235 B.C.E.) and Tiglath-Pileser I (1114–1076 B.C.E.). However, Nineveh had to wait for the neo-Assyrian kings, particularly from the time of Ashurnasirpal II (ruled 883-859 B.C.E.) onward, for a considerable architectural expansion. Thereafter successive monarchs improved old royal dwellings and founded impressive new palaces for themselves and their children, as well as temples to such deities Sîn, Nergal, Shamash, Ishtar, and Nabu. Nineveh was the largest city in the world prior to its destruction in 612 B.C.E. It was Sennacherib (reigned 705–681 B.C.E.) who made Nineveh a truly magnificent city. He laid out new streets and squares and built within it the famous "Palace without Rival." The plan of this impressive structure has been mostly recovered and has overall dimensions of about 503 by 242 meters (1680 by 810 ft). It comprised at least 80 rooms, many of which were lined with sculpture. A large number of cuneiform tablets were found in the palace. The solid foundation was made out of limestone blocks and mud bricks; it was 22 meters tall. This represents a total of about 2.68 million cubic meters and 160 million bricks. Extending from its roof were additional brick walls rising another 20 meters. Some of the principal doorways were flanked by colossal stone door figures weighing up to 30 tons. The included many winged lions or bulls with a man's head. These stones had to be transported 30 miles from quarries at Balatai and lifted up 65 feet once they arrived at the site, presumably by a ramp. The structures internal walls featured 9880 feet of stone panels carved in bas-relief, that include pictorial records every step of the building process, including carving the statues and transporting them on a barge. One picture show 44 men towing a colossal statue and men directing the operation while standing on the colossus. Once the statues arrived at their final destination, the final carving was done. Most of the statues weigh between ten and 30 tons. 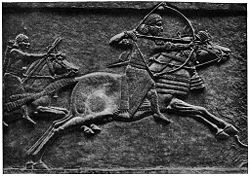 The stone carvings in the walls include many battle scenes showing Sennacherib's men parading the spoils of war before him. He also bragged about his conquests in various inscriptions. In Sennacharib's time the total area of Nineveh comprised about 1,800 acres (seven km²). The city's walls featured 15 great gates. An elaborate system of 18 canals brought water from the hills to Nineveh, and several sections of a magnificently constructed aqueduct erected by Sennacherib were discovered at Jerwan, about 40 km (25 miles) distant. The enclosed area had more than 100,000 inhabitants, possibly as many as 150,000, about twice as many as Babylon at the time, and it became the largest settlement in the world shortly thereafter. The palaces and temples of Nineveh were further improved during the reign of Ashurbanipal (reigned 669–c. 631 B.C.E. ), who not only left detailed bas-relief depictions of his reign but also collected thousands of cuneiform texts from throughout the Assyrian Empire in the library of Nineveh. Most of these clay-tablet documents have survived, providing scholars not only with a rich cache of information, but tools which proved invaluable in the deciphering of cuneiform. Literary genres found during excavations include word lists, bilingual vocabularies, medical diagnoses, omen texts, astrological texts, and famous mythological literature such as Enuma Elish and the Epic of Gilgamesh. Nineveh's greatness was short-lived, however. Around 633 B.C.E. the Assyrian empire began to show signs of weakness, and Nineveh was attacked by the Medes, who about 625 B.C.E., joined by the Babylonians and Susianians, again attacked it. Nineveh fell in 612 B.C.E. and was razed to the ground. The people of the city who could not escape to the last Assyrian strongholds in the west were either massacred or deported. Many unburied skeletons were found by archaeologists at the site. The Assyrian Empire soon came to an end, the Medes and Babylonians dividing its provinces between them. Following the city's destruction in 612 B.C.E., the site remained unoccupied for centuries until the Sassanian period. The city is mentioned again in the Battle of Nineveh in 627 C.E., which was fought between the Eastern Roman Empire and the Sassanian Empire of Persia near the ancient city. From the Arab conquest 637 C.E. until modern time the city of Mosul on the opposite bank of the river Tigris became the successor of ancient Nineveh. 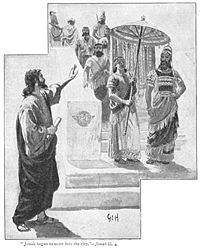 In the Bible, Nineveh is first mentioned in Genesis 10:11: "Ashur left that land, and built Nineveh." Although the Books of Kings and Chronicles say a great deal about the Assyrian Empire, Nineveh itself is not mentioned again until the Book of Jonah, when it is described (Jonah 3:3 ff; 4:11) as an "exceeding great city of three days' journey," probably referring to its circumference. This would make its circumference about 100 km (60 miles). God sent Jonah to preach to Nineveh, the capital of Israel's mortal enemy, threatening it with destruction because of its pride. The Book of Jonah relates that Jonah's reason for initially fleeing from his prophetic duty was not fear, but that he knew that if the people of Nineveh repented, God would spare the city. When God saw what they did and how they turned from their evil ways, he had compassion and did not bring upon them the destruction he had threatened. But Jonah was greatly displeased and became angry. He prayed to the Lord, "O Lord, is this not what I said when I was still at home? That is why I was so quick to flee to Tarshish" (Jonah 3:10-4:2). Nineveh was the flourishing capital of the Assyrian empire (2 Kings 19:36; Isa. 37:37). The book of the prophet Nahum is almost exclusively taken up with prophetic denunciations against it. Its ruin and utter desolation are foretold (Nahum 1:14; Nahum 3:19). Its end was to be strange, sudden, tragic (Nahum 2:6–11). It would become a "desolation." The prophet Zephaniah 2:13–15 predicted its destruction along with the fall of the empire of which it was the capital. Before this catastrophe, however, Nineveh, as the capital of Assyria, fulfilled a providential purpose: namely to punish the kingdoms of Judah and Israel for their sins. In 722 B.C.E., the Assyrian army conquered Israel under King Hoshea, deporting many of its leading citizens and sending Assyrian colonists to take their place. Later, Sennacherib nearly conquered Judah as well, capturing every major city except Jerusalem. Simplified plan of ancient Nineveh showing city wall and location of gateways. Before the excavations in the 1800s, historical knowledge of the great Assyrian Empire and of its magnificent capital was almost wholly a blank. Other cities that had perished, such as Palmyra, Persepolis, and Thebes, had left ruins to mark their sites and tell of their former greatness; but of this city, imperial Nineveh, not a single vestige seemed to remain, and the very place on which it had stood became only matter of conjecture. In the days of the Greek historian Herodotus, 400 B.C.E., Nineveh had become a thing of the past; and when Xenophon the historian passed the place in the Retreat of the Ten Thousand the very memory of its name had been lost. It was buried out of sight. Today, Nineveh's location is marked by two large mounds, Kouyunjik and Nabī Yūnus "Prophet Jonah," and the remains of the city walls (about 12 km/7.5 mi in circumference). The Neo-Assyrian levels of Kouyunjik have been extensively explored. The other mound, Nabī Yūnus, has not been extensively explored because there is a Muslim shrine on the site. However, Iraqi excavations on Nabī Yūnus in 1990, exposed a number of large Neo-Assyrian sculptures that appeared to be the entrance to a palace. 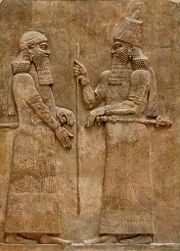 Sargon II (right) greets a dignitary, possibly the Crown Prince Sennacherib. In the nineteenth century, the French consul at Mosul began to search the vast mounds that lay along the opposite bank of the river. These excavations uncovered the royal palace of Sargon II (722–705 B.C.E. ), which was largely explored for sculptures and other precious relics. In 1847, the young British adventurer Sir Austen Henry Layard explored the ruins. In the Kuyunjik mound in 1849, Layard discovered the glorious edifice of Sennacherib, the "Palace without Rival," with many rooms and colossal bas-reliefs. He also unearthed the famous library of Ashurbanipal with 22,000 cuneiform clay tablets. The work of exploration was carried on by George Smith, Hormuzd Rassam, and others, and a vast treasury of specimens of Assyria was incrementally exhumed for European museums. Palace after palace was discovered, with their decorations and their sculptured slabs, revealing the life and manners of this ancient people, their arts of war and peace, the forms of their religion, the style of their architecture, and the magnificence of their monarchs. The mound of Kuyunjik were excavated again by the archaeologists of the British Museum led by Leonard William King, at the beginning of the twentieth century. Their efforts concentrated on the site of the Temple of Nabu, the god of writing, where another cuneiform library was supposed to exist. However, no such library was ever found. Most likely, it had been destroyed by the activities of later residents. The excavations started again, in 1927, under the direction of Campbell Thompson. Some digs were carried out on the mound of Nebi Yunus and along the outside walls. Here, near the northwestern corner of the walls, the archaeologists found almost 300 fragments of prisms recording the royal annals of Sennacherib, Esarhaddon, and Ashurbanipal. After World War II, several excavations were carried out by Iraqi archaeologists. Nineveh was also revisited by British archaeologist and Assyriologist David Stronach of the University of California, Berkeley beginning in 1981. He conducted a series of surveys and digs at the site from 1987-1990, focusing his attentions to the several gates and the existent mud brick walls, as well as the system that supplied water to the city in times of siege. Eastern city wall & Shamash Gate. Examining an inscription at Sennacherib's palace on Kuyunjik. The ruins of Nineveh are surrounded by the remains of a massive stone and mudbrick wall dating from about 700 B.C.E. About 12 kilometers in length, the wall system consisted of a stone retaining wall about 6 meters high surmounted by a mudbrick wall about 10 meters high and 15 meters thick. The retaining wall had projecting stone towers spaced about every 18 meters. The stone wall and towers were topped by three-step battlements. The wall's 15 monumental gateways served as check points on entering and exiting the city and were probably used as barracks and armories. With their inner and outer doors closed, the gateways were virtual fortresses. Within each gate structure, a stairway led from one of its interior chambers to the top of the city wall. Mashki Gate. Translated "Gate of the Watering Places," this entrance was probably used to take livestock to water from the Tigris River, which currently flows about 1.5 km. to the west. It has been reconstructed in fortified mudbrick to the height of the top of the vaulted passageway and seems accurate as far as it goes. The Assyrian original may have been plastered and ornamented. Nergal Gate. Named for the god Nergal and excavated in the nineteenth century, this gate may have been used for some ceremonial purpose, as it is the only known gate flanked by stone sculptures of winged bull-men. Adad Gate. Named for the god Adad, this gate was partly reconstructed in the 1960s by Iraqis. The result is an uneasy mixture of concrete and eroding mudbrick, which nonetheless does give one some idea of the original structure. The original brickwork of the outer vaulted passageway is well exposed, as is the entrance of the vaulted stairway to the upper levels. Shamash Gate. Named for the Sun god Shamash, this gate was first excavated by Layard in the nineteenth century and partly reconstructed in the 1960s. Its structure projects outward about 20 meters from the line of the main wall, the only gate with such a significant projection. Its size and design suggest it was the most important gate in Neo-Assyrian times. Halzi Gate. Located near the south end of the eastern city wall, exploratory excavations were undertaken on this gate by the University of California expedition of 1989-90. It features an outward projection from the main city wall, though not as pronounced as at the Shamash Gate. Human remains from the final battle of Nineveh were found in the passageway. The ruin mound of Kuyunjik rises about 20 meters above the surrounding plain of the ancient city. It is quite large, measuring about 800 m x 500 m. Its upper layers have been extensively excavated and several Neo-Assyrian palaces and temples have been found there. A deep sounding revealed evidence of habitation as early as the sixth millennium B.C.E. A small area of undisturbed post-Assyrian remains was identified in 1990 near the southwest corner of Kuyunjik. Since 1990, the palace chambers have received significant damage by looters. Portions of looted relief sculptures were seen on the antiquities market by 1996. Photographs of the chambers made in 2003 show that many of the fine relief sculptures of these palaces have been reduced to piles of rubble. Nebi Yunus, located about one kilometer south of Kuyunjik, is the secondary ruin mound at Nineveh. On the basis of texts left by Sennacherib, the site has traditionally been identified as the "armory" of Nineveh, and a gate and pavements excavated by Iraqis in 1954 have been considered to be part of the "armory" complex. Excavations in 1990 revealed a monumental entryway consisting of a number of large inscribed orthostats (stone slabs set at the base of a wall) and "bull-man" sculptures, some apparently unfinished. ↑ Genesis 10:11 BibleGateway.com. Retrieved March 26, 2013. ↑ Tertius Chandler, Four Thousand Years of Urban Growth: An Historical Census (Edwin Mellen Press, 1987, ISBN 978-0889462076). Bonomi, Joseph. Nineveh and Its Palaces: The Discoveries of Botta and Layard, Applied to the Elucidation of Holy Writ. Piscataway, NJ: Gorgias Press, 2003. ISBN 9781593330675. Brackman, Arnold C. The Luck of Nineveh: Archaeology's Great Adventure. New York: McGraw-Hill, 1978. ISBN 9780070070301. Layard, Austen H. Discoveries in the Ruins of Nineveh and Babylon: With Travels in Armenia, Kurdistan and the Desert. Library of history and archaeology. London: Kegan Paul, 2004. ISBN 9780710310774. Russell, John Malcolm. Sennacherib's Palace Without Rival at Nineveh. Chicago: University of Chicago Press, 1991. ISBN 9780226731759. John Malcolm Russell: "Stolen stones: the modern sack of Nineveh"
This page was last modified on 4 December 2018, at 18:02.